The Vedic culture and its philosophy is one of the most deeply spiritual and all encompassing traditions in the world, and has been a major contributor to philosophical thought and the development of civilization. It does not take that long to understand, but it can take some serious consideration. Until then, there can be some aspects of it that are misunderstood or misinterpreted. 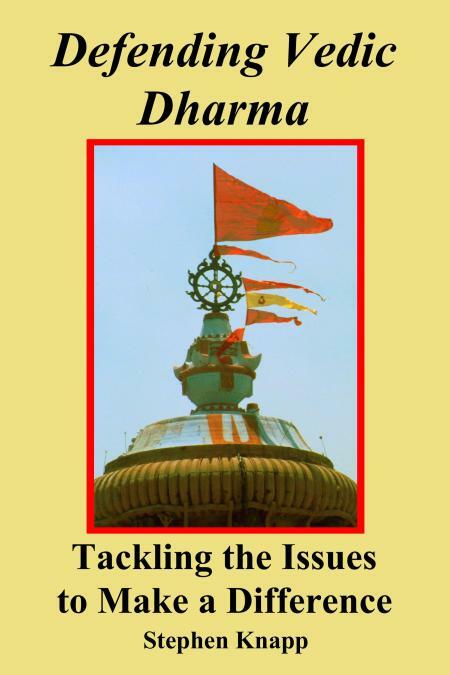 Therefore, this book takes some of the issues of the day and describes what they are and the remedies for dealing with them in order to make a difference in how we participate in Vedic culture, how we can make it more effective in our lives, and how it can be perceived in a more positive way. All of this makes a difference in the objectives of preserving, protecting, promoting, and perpetuating the Vedic spiritual path. So this book shows some of the many uplifting and insightful qualities we can find in the Vedic tradition, of which everyone should be aware and can appreciate. Why it is important to use the proper vocabulary to express Vedic concepts. Why all religions really are not the same, though many Hindus and gurus like to think they are. Time to wake up to reality. The power of a united Vedic community, and how it could rapidly change things if Hindus actually became more united and worked together. The importance of becoming a Dharmic leader and to do your part, and the danger of Hindu teachers who really do not lead in a way they should. The long-term but realistic cure for the corruption in India. The importance of Vedic temples as centers of sacred knowledge, and why temples should be open to everyone. How and why the Vedic texts say that the knowledge within them must be shared with everyone. The real purpose of the natural Vedic way of social arrangement, but why the present caste system in India should be changed or thrown out completely. An eight point action plan for how Hindus in America can best use the freedoms they have, which often exceed the decreasing freedoms in India, to cultivate their tradition to its fullest extent while they have the means to do so. The clarity with which these and other issues are addressed make this an important book for consideration. To Order Your Copy: The book is $12.95, 6"x9" trim size, 214 pages, ISBN-13: 978-1466342279, ISBN-10: 1466342277.